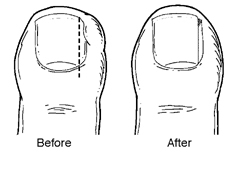 When a toenail is ingrown, it is curved and grows into the skin, usually at the nail borders (the sides of the nail). This digging in of the nail irritates the skin, often creating pain, redness, swelling, and warmth in the toe. Trauma: Sometimes an ingrown toenail is the result of trauma, such as stubbing your toe, having an object fall on your toe or engaging in activities that involve repeated pressure on the toes, such as kicking or running. Proper trimming: Cut toenails in a fairly straight line, and do not cut them too short. You should be able to get your fingernail under the sides and end of the nail. Well-fitting shoes and socks: Do not wear shoes that are short or tight in the toe area. Avoid shoes that are loose because they too cause pressure on the toes, especially when running or walking briskly. Do not cut a notch in the nail: Contrary to what some people believe, this does not reduce the tendency for the nail to curve downward. Do not repeatedly trim nail borders: Repeated trimming does not change the way the nail grows and can make the condition worse. Do not place cotton under the nail: Not only does this not relieve the pain, it provides a place for harmful bacteria to grow, resulting in infection. Over-the-counter medications are ineffective: Topical medications may mask the pain, but they do not correct the underlying problem.